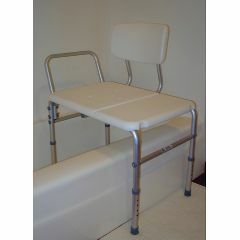 Increases safety and convenience during bathing. Textured molded backrest and non-padded seat with drainage holes. Legs adjust in 1/2 inch increments with push-buttons to a height between 16.5 and 20.5 inches. Sunmark Wall Grab Bar, 16"
Sunmark Wall Grab Bar, 18"
Sunmark Wall Grab Bar, 24"